Learning to sing or play a musical instrument can help disadvantaged children improve their reading skills, US research suggests. After a year of music lessons, the reading scores of nine and 10-year-olds held steady compared to a dip seen in those who were not taught any music. 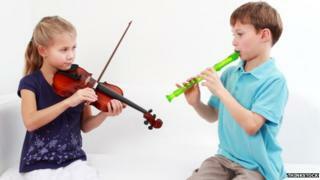 Another group of musically-trained children were found to be better at processing sounds and language. The research is being presented to the American Psychological Association. The research was led by Dr Nina Kraus at Northwestern University and involved hundreds of children at high schools in impoverished areas of Chicago and Los Angeles. Her research had previously highlighted that learning music could improve the concentration, memory and focus of children in the classroom by improving their neural functions. But much of the research had focused on the impact of music lessons on relatively affluent children. In this study, Dr Kraus found that giving children regular group music lessons for five or more hours a week prevented any decline in reading skills, which would normally be expected in poorer areas. Another group of teenage schoolchildren, from a poor area of Chicago, took part in band practice or choir practice every day at school as part of a music project. Researchers recorded their brainwaves to assess how they responded to speech sounds. After two years of musical training, the results showed the musical group was faster and more accurate at distinguishing one sound from another, particularly when there was background noise, compared to a group that did not participate in any musical activity. Dr Kraus said this showed music could have a positive impact on the brain, which could also help learning, but it was not a quick fix. "Research has shown that there are differences in the brains of children raised in impoverished environments that affect their ability to learn," he explained. "While more affluent students do better in school than children from lower income backgrounds, we are finding that musical training can alter the nervous system to create a better learner and help offset this academic gap." All the children had similar IQs and reading ability at the start of the study. Dr Kraus said music appeared to remodel the brain to improve the connections between sounds and meaning, the process by which babies learn to speak. Children growing up in poorer areas with poorly-educated mothers are more likely to have 'noisier brains', she said. This is because they are less likely to know and recognise a wide range of words and are therefore less able to respond to sounds and language. "Music automatically sharpens the nervous system's response to sounds," Dr Kraus explained. The children participating in the study were part of the Harmony Project, which provides instruments and free music tuition for American schoolchildren in certain deprived urban areas.